Jason Watkins (aka Badger) is the artist and owner behind Paradox Pewter Creations. Founded in 1999, Paradox Pewter Creations started out as a small business specializing in custom pewter products like pins, charms and wax seals. As his business grew, he realized it was time to invest in his own laser cutter. 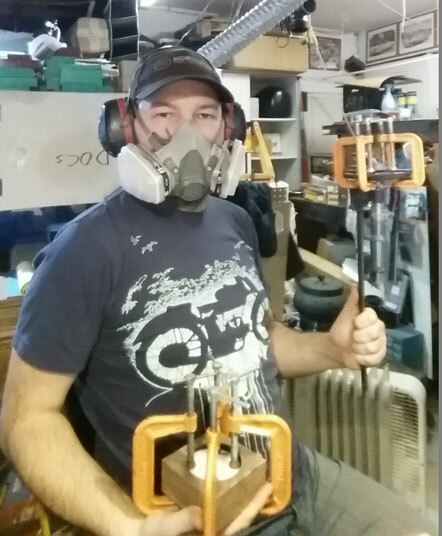 This is when Jason realized he could combine his old love of engineering with a a new love of woodworking to construct a remarkable new line of products. In addition to his on-going pewter casting business he now has a line of beautifully constructed boxes, each with their own unique and magical way of opening. He has a lovely girlfriend who occasionally helps him and two lazy cats who don’t do a darn thing other than sleep and eat.